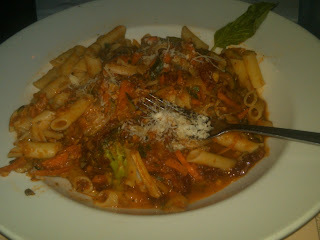 The other night I went to C & O Trattoria. I had heard whispers of the restaurant now offering gluten free pasta and I knew I needed to try it on this particular Friday night because I was planning to do a half-marathon the next morning. Before Friday I had only been to C & O one time before with my sister and my friends Lyz and Allison. 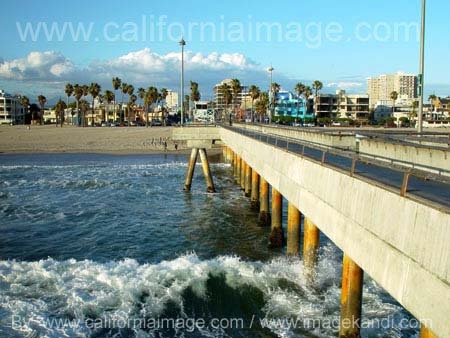 It was a fine place to visit with a great location -- practically on the Venice pier. It could be a great spot to take a date and then take a moonlight stroll along the Pier... or a great spot to overload yourself on carbs if you're on an awkward date and then call the "I'm too full" card when your date tries to ask you for after dinner drinks. Either way, I could see it as a fun date place. 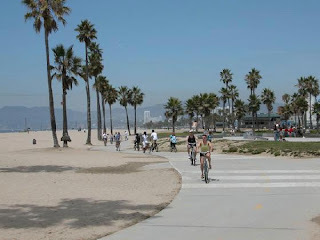 Sometimes when I check out pictures of Los Angeles, I ask myself, "Do you really live here?" It's so beautiful! However for the gluten free eater C & O presents some big obstacles as its main plates involve pasta. I can't quite remember what I ate when I first visited, but I vividly remember salivating over the (unlimited!) garlic knots that the restaurant serves up. This time around I was intent on avenging my first visit by ordering a big heaping bowl of gluten free pasta and wolfing it down. Sadly the restaurant has not yet created a gluten free alternative, but here's to hoping that upon my next visit C & O will have remedied that situation. To help me in my carb adventures, my friends Annie, Lauren, Sarah, Anthony, Chris, Ashley, Catherine, Shannon, Ali, and Jess joined me. I ordered the Spaghettini Verdure, although the gluten free pasta only comes in ziti. Regardless, the order was amazing. It has been such a long time since I've ordered pasta in a restaurant I was jubilant -- I could not stop singing its praises. It was a great way to carb up for my half marathon. It was the longest race I've done so far; while I've run more than 13 miles at a time, I've never done so in a race format. I was happy with my time but not ecstatic. Having never run the course, I'm just happy I finished it -- the course was a little repetitive (repeating the same loop 3 times by the end of it). If anything, it really made me appreciate the spectators at another great race I've done, the Boilermaker. Hopefully I'll make it to another Boilermaker soon. I'm also not totally sure if "carbing up" is necessary. I've been a bit brainwashed from a book I just read, "Born To Run" (thanks for the recommendation Angi!). I picked up a pair of Vibrams before I started to train in earnest and am excited to begin using them again once my training is over. Anyway, back to the pasta. I wholeheartedly recommend this place for those of you gluten free folk who are dying for a pasta dish at a restaurant instead of always having to make it home. The atmosphere is great, the wine is cheap, and for your gluten-eating friends it isn't a stretch to love this place too.